The security weaknesses of WEP led researchers to design a new standard under the name 802.11i. The main security protocols of the 802.11i standard are the Wireless Protected Access (WPA) and the Wireless Protected Access II (WPA2). Although these protocols provide significant higher security level than WEP they also present serious issues that can allow an attacker to recover the Passphrase , break into the wireless network and gain unauthorized access. Below we show some methods and techniques on how to break the wireless networks and recover the WPA/WPA2 passphrase. Before quickly diving into the next part, I would like to inform the readers to have a look into the first part of this post by title State of the Art – Wifi Security. Also, there are hundreds of quick post/tutorial videos in this topic , But this is my way of presentation and as always feel free to comment on the writing as well on the technical demo , which will help me to correct my future work. Also, some screen shots may not reveal actual attack results, but the command does, I did it on purpose and I encourage readers to obtain fluency on using the air-crack suite tools. In order to better understand each WPA/WPA2 Passphrase recovery attack, various real-life scenarios will be presented. Each scenario examines in detail the techniques, the tools and the benefits of different WPA/WPA2 Passphrase recovery attack. recover the passphrase from a WPA/WPA2 secured wireless network where the topology includes an Access Point and at least one connected client. The Access Point with MAC address ‘00-1C-F0-AE-83-F8’ which will be our target network .The administrator of this network has enabled WPA (TKIP) encryption in order to secure the communications. The length of the WPA passphrase is 14 characters long. A legitimate client with MAC address ‘00:27:19:FF:F3:14’ is connected to this wireless network and is browsing the Internet. Having the above information you can proceed to the next steps of this lab attack scenario. In ‘Step 2’ of the scenario, we identified at least one connected client to the target wireless network (MAC address 00:27:19:FF:F3:14). The goal of this Step is to capture the 4-way authentication handshake between the Client and the Access Point and extract the information that will be used during the Passphrase recovery attack (SSID, Anonce, Snonce, AP-MAC address, Client-MAC address). Since the Client is already connected we have the options either to wait for another client to connect and capture the 4-way handshake or de-authenticate the client and capture the handshake when he will try to automatically reconnect. The second option is faster so open a new Terminal Window and type the following command to launch a de-authentication attack against the connected client. Note:Don’t press enter yet! Now at the Terminal window where the de-authentication attack command is typed press the enter key to launch the attack. The aireplay-ng tool spoofs the MAC address of the Access Point and sends 15 de-authentication frames to the connected wireless client (figure). The client is deceived that the de-authentication frame comes from the Access Point and immediately disconnects from the network. 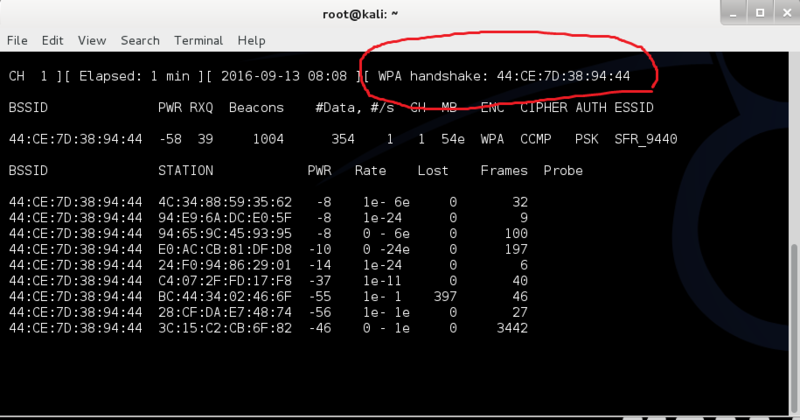 So far we have identified a wireless network with a connected client and we have captured the 4-way handshake. We can now launch the dictionary attack against the Passphrase. As we have described at the beginning of this Chapter, during this attack random Passphrases will be selected from a dictionary file in order to generate a possible PSK. The PSK will be combined with the captured values of the 4-way handshake to produce the PTK which in turn will be used to generate the MIC. If the MIC matches with the MIC captured in the 4-way handshake messages then the selected Passphrase is the one we are searching. If not the whole process will repeat over and over until the values in the dictionary file are exhausted. 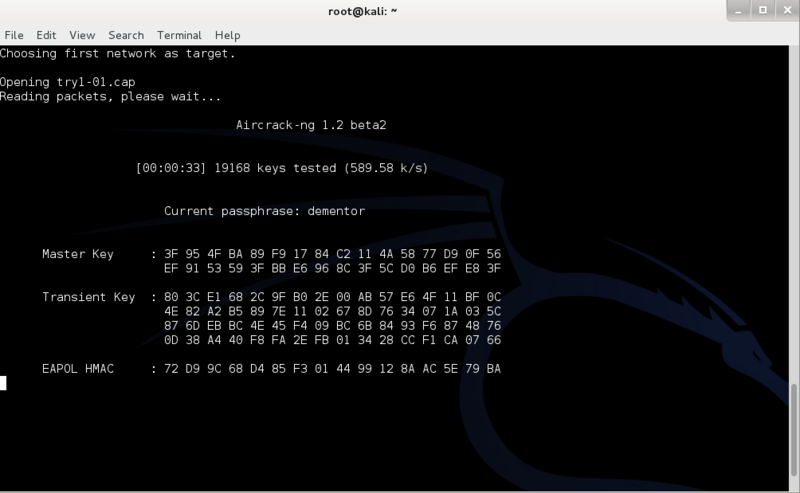 In this scenario, we will demonstrate how we can recover the WPA/WPA2 Passphrase using only the wireless client. In most cases, a wireless client is not in range with the preferred Access point but his WNIC is activated and the wireless network manager is looking for access point to connect. Every Operating system stores the configuration of a wireless connection (SSID , username, Key) in order to connect automatically to the preferred wireless network when it comes into range. 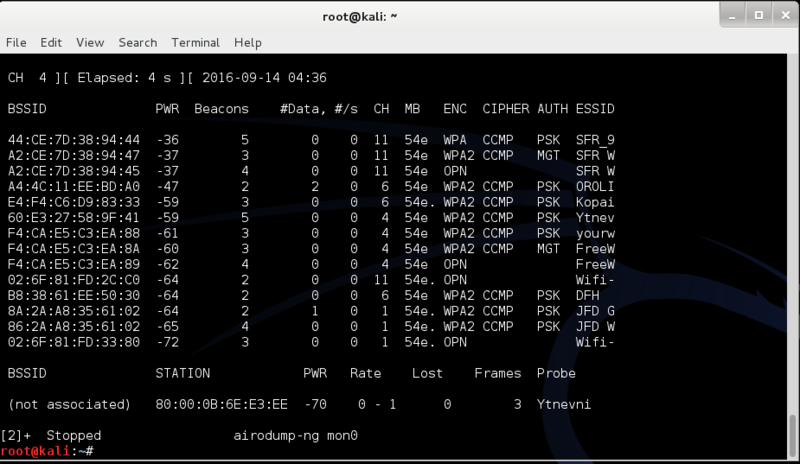 Using this feature we are going to exploit to attack the client and recover the WPA/WPA 2 passphrase. From the above screenshot we can see that the wireless client with MAC address 80:00:0B:6E:E3:E3:EE is trying to associate with its preferred access point. The indication “Not associated” under the BSSID column means that the wireless client is automatically looking to connect to its preferred Access point (in most cases it must be office or home network) that was connected in the past and now it’s not available. After issuing the above command we need to wait until the legitimate client connects to the fake Access point . 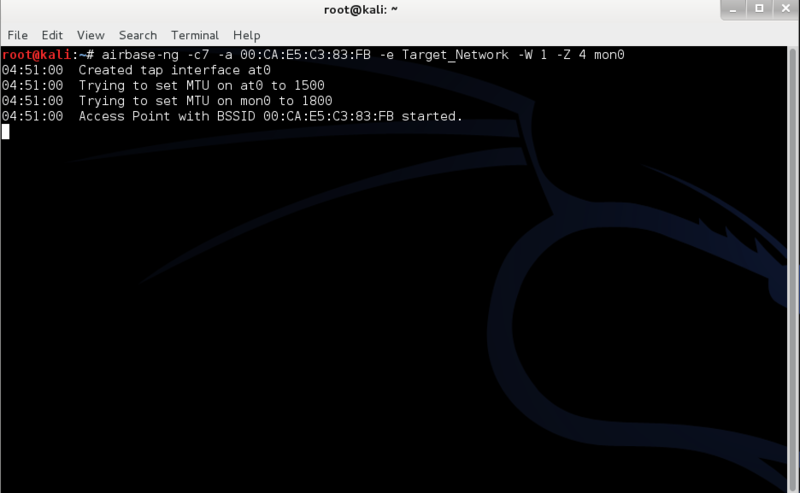 Once it connects to it we will have the msg “client <bssid> associated” as shown in the following screenshot. After capturing the 4-way handshake , we are now ready to crack the passphrase and the steps to do it will be the same as the previous scenario. We can now launch the dictionary attack against the Passphrase. As we have described at the beginning of this Chapter, during this attack random Passphrases will be selected from a dictionary file in order to generate a possible PSK. The PSK will be combined with the captured values of the 4-way handshake to produce the PTK which in turn will be used to generate the MIC. If the MIC matches with the MIC captured in the 4-way handshake messages then the selected Passphrase is the one we are searching. If not the whole process will repeat over and over until the values in the dictionary file are exhausted. It is very important to mention that if the Passphrase was not included in the dictionary file we used then aircrack-ng wouldn’t be able to recover it. Always remember that a dictionary attack is as good as the dictionary used for the attack. I am trying this on my own wifi, what is the problem if I get the error message: ls: cannot access ‘system/class/ieee80211/’ no such file or directory? I am just starting out with kali linux. well written and very good explanatory. well done.